Late in December of 2016 after nearly a full year delay from the originally slated released date the InvizBox Go was released onto the market. If you haven’t previously heard of it the InvizBox Go is a portable router with VPN and Tor capabilities plus a few additional features and I’ve been taking a look to see if it’s actually any good. InvizBox might be a name that you’re familiar with. In 2014 big interest was raised in a product that went on to become the Anonabox, but after some serious failings a successor appeared and was released in 2015 simply called the InvizBox. 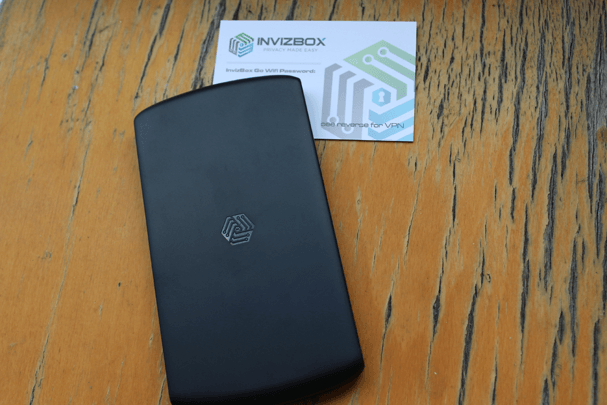 We took a look at the InvizBox back in 2015 and found it to be a decent little product but lacking any VPN functionality and only catering for Tor users its usage was a little limited, especially for a site such as ours. The InvizBox Go is essentially the bigger, stronger and more feature packed brother and over the last few months I’ve been throwing it in my bag wherever possible and carrying it with me to see what it’s all about. The InvizBox Go is a portable router with VPN and Tor functionality, it also has additional features such as power bank capability that can fully charge a mobile phone twice and can be used as a Wi-Fi extender. It’s basically a hardware solution that allows you to connect to an “always on” VPN connection. Creating a new WiFi access point you can connect directly to the InvizBox Go and be covered by a secure VPN connection. The portable sized device also lets you access the Tor network too but for the purpose of this review, I’ll be concentrating mainly on the VPN aspect. The InvizBox Go comes in a tamper proof box with a once only removable label. This is a security feature to show the device hasn’t been tampered with between it being dispatched from InvizBox themselves and reaching your location. This may seem a little overkill but with stories of intelligence agencies intercepting packages to hide bugs or other tracking implements into products, it isn’t without reason. I also managed to get a soft carry pouch designed exclusively for the InvizBox Go. The pouch is worth its weight in gold because the device is designed to be carried with you and when you’re throwing it in a bag on daily basis it saves it getting scratched and scuffed. Thankfully set-up has been made incredibly easy. Devices of these types usually alienate those with a lower technical skill and while it’s probably still not going to be easy enough for your Mum to use if she struggles to turn her mobile phone on, it will be easy enough for the majority of everyday users. Starting the device was simple, by holding down the central soft-push power button for a second or two. The power indicator flashed green and the Wi-Fi light began to blink. 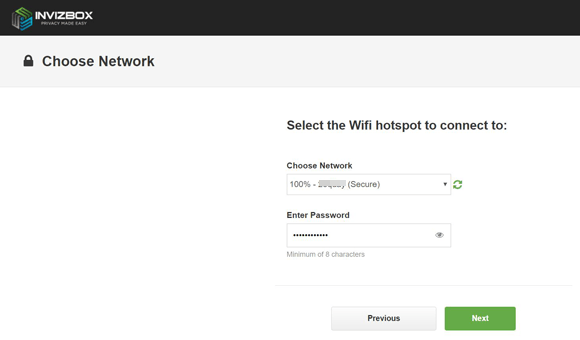 A new Wi-Fi hotspot was created named InvizBox-SetUp. Next I connected to the newly created hotspot and was pushed towards an InvizBox Go set-up screen. This was automatic both on my Microsoft Surface Pro device running Windows and my Android mobile phone. After logging in with the supplied unique password, all I had to do was select a Wi-Fi network that I wanted the InvizBox to connect to. On the next screen I could select an initial VPN country and if I wanted I could even select in individual server. Set-up was pretty much complete. A new Wi-Fi hot spot initially called InvizBox was created which is now your gateway to the internet. It is of course possible to change this hot spot name in the set-up if you wanted to name it something a little less obvious. The InvizBox Go has certainly been created with portability in mind. At about the same physical size as an iPhone 7 (Just under 13cm in length and under 7cm in width) and slightly lighter the device can be thrown in a bag and carried around with you easily. The idea behind this is you should use the device wherever you go allowing you to protect your privacy when connecting to any public Wi-Fi network. VPN connectivity is provided by InvizBox themselves using the IPVanish network which is great news in itself because IPVanish provide one of the fastest VPN networks in the world and they’re currently our number 1 rated VPN service. In terms of physical use the soft carry pouch came in handy as it stopped the InvizBox Go getting knocked and scratched as it was carried around in my bag. Although it does feel pretty robustly made even if you don’t have one. Using the device while out and about is one of the main purposes of the device and although I always make use of a software VPN solution there are the initial few seconds after connecting until launching a software solution that can lead to leaking your private data. It’s those few seconds which are often critical as everything that needs internet finally sees a connection and starts to download or update. This is especially true if you use an email client on a laptop and even more true if you use your tablet or mobile a lot as everything from communications apps to social media, email and more will all start connecting and downloading the instant an internet connection is detected. Due to the InvizBox Go connecting to the public Wi-Fi network and you connecting to the InvizBox Go it completely removes that issue. The InvizBox Go is designed to be taken anywhere. Using the InvizBox Go did add 30 seconds or so to my connection. Rather than tap in the public Wi-Fi details directly on your laptop, tablet or phone you firstly have to connect to the InvizBox, login and then set up connection to the Wi-Fi network. This is one of the only niggles about set-up, all those hot spots I already had saved needed to be reconnected to. Admittedly this is a once-only issue. In other circumstances if you’ve got a couple of devices this could actually save you time because they all only need to connect to the InvizBox Go and not be individually set-up to connect to the public Wi-Fi network. The InvizBox Go can be used at home in the same fashion that it can be used while out and about. One usage I found excellent is you can set it up as a hot spot for a specific country. For example, say you live in France and want to access everything through your normal connection but you want a specific UK hot spot that will allow you to watch BBC iPlayer, Sky Go or access other UK specific services. This is entirely possible. You can have a dedicated hot spot just for that very purpose. This allows you to browse the web as normal but when needed switch over. The other obvious use is to have a dedicated encrypted hot spot allowing any device that connects to it to be protected by the VPN service. If you have older devices or devices that don’t support VPN connections then the InvizBox Go now opens up that possibility. This is great news if you have a SmartTV or other device that can access Wi-Fi but can’t directly use a VPN service. There is also the option to use the device as a Wi-Fi extender, so if you have poor Wi-Fi reception in a location in your home then you can extend the signal by using the InvizBox Go and while I don’t have a need for this function myself there will be plenty who do. 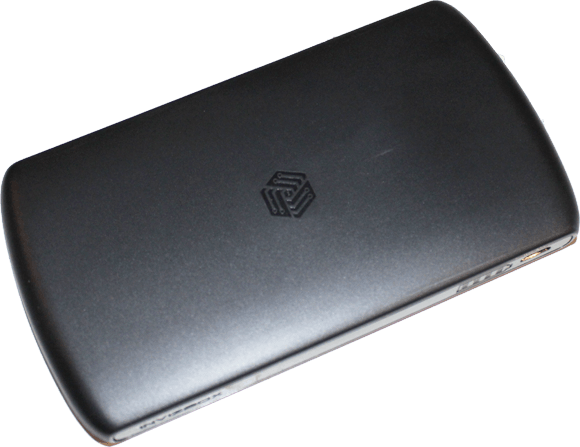 Alongside the privacy capabilities, the InvizBox Go also has a massive 5000mAH 18.5Wh Power Bank feature. This will allow you to charge your portable devices such as mobiles and tablets. Depending on what type of device you’ve got will depend on how many charges you get but a good guide for a modern mobile phone should be somewhere between 2 to 3 full charges. This is a great little addition to the device and made carrying it around on a permanent basis so much more useful. One thing I disliked was the InvizBox Go can get hot, especially when charging or being highly utilised, while you won’t burn yourself it did get a little hotter than I would have liked. With this in mind, it’s best using it in a well-ventilated space and not from inside your backpack or the carry case. You may also want to keep small hands away from it if you have kids. Accurate reporting of speed when testing VPN services is incredibly hard. While I may get good speeds on one server in one country, you may get completely different mileage. What I can say however is speeds on the InvizBox Go for me were generally very good, especially for a portable router of this size. Other similar devices and products of recent years usually hover around 11 Mbps maximum but with the InvizBox Go I was able to squeeze out 21 Mbps and even on retesting I got nearly 15 Mbps. This was all on a Wi-Fi connection that normally only reaches 43 Mbps on its own. It has to be said that the connected speed was in optimal conditions using the nearest physical VPN server. You certainly won’t want the InvizBox Go sitting between your home router if for example you’re a big downloader of torrents who needs maximum speed. While at the same time it really isn’t what the device was intended for. If however you want to go about your everyday browsing routine, watching videos and doing the kind of regular internet tasks we all do then the InvizBox Go is certainly fast enough. I’ve known full sized VPN routers to offer less speed so it’s testament to the device that it can squeeze out such speed figures. From the moment the InvizBox Go was announced I was awaiting its arrival with bated breath. After nearly a year of delays it finally arrived and I can honestly say it was worth the wait. The build quality of the device is excellent which was slightly unexpected from an IndieGoGo funded product. The design and quality of the device are certainly up there with any other product manufactured by a large company. Using the InvizBox Go is incredibly easy and even if you’re a novice I don’t envisage you having any trouble setting it up and getting yourself protected. 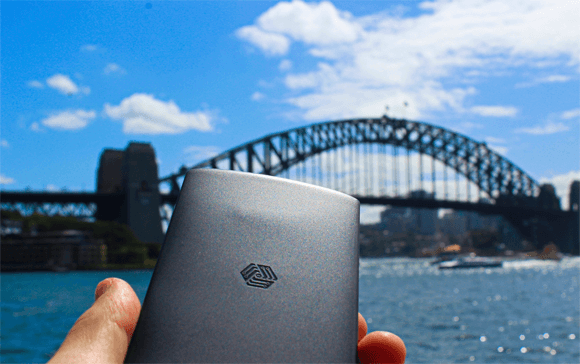 Portable enough to be taken anywhere in the world. I especially liked the fact I could connect Wi-Fi enabled devices that don’t have VPN functionality such as my SmartTV and use it to bypass region restrictions. Of course, with any portable device of this nature there is always going to be a speed hit. Encryption is a high intensity task and the meagre power of such a small device is never going to be enough for you to get anywhere near your full internet speed. That said speeds were reasonable and are certainly good enough to stream high quality video, access websites, send email and whatever else you’re likely to want to do on the internet. It won’t however let you download at lightning fast speed. It’s a shame you can’t use the InvizBox Go with other VPN services out of the box but I guess this makes sense as they created the product so want to make sure you use it with their service. 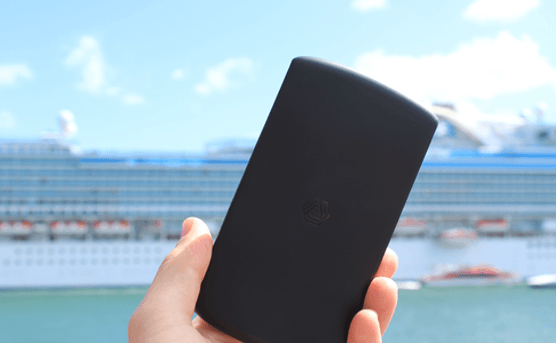 The power bank feature is a handy addition to the device and other features such as the Wi-Fi extender really makes it feel like a product that is the solution to more than one problem. Aside from getting a little hot I really don’t have much to fault the InvizBox Go on. Unfortunately I think for some requiring an extra step in the connection process will put them off due to sheer laziness, for others who appreciate their privacy it won’t be too much of a burden. My InvizBox Go will be kept with me at all times, a great little product that protects my privacy and allows me to charge my phone. My recommendation? Get yourself one and fast. The InvizBox Go costs between $99 and $499. The cheapest coming with a 2-Month VPN subscription and the most expensive coming with a lifetime subscription. There are plenty of options in-between. Just follow the button below to visit InvizBox.